059: Kimberly Davis—Leading Change: Are You A Brave Leader? Listen now to Kimberly Davis talk about how to be a brave leader! In our Our The Brink podcasts, we focus on helping you make the changes that are essential for your growth, personally and professionally. Managing change requires you to become a brave leader. But how do you lead when those around you are watching to see if you succeed or fail? In this podcast, Kimberly Davis brilliantly helps us understand authentic leadership, how to find your courage, and how to trust your instincts to help others find the way forward. Don't miss it! Additionally, Kimberly teaches "Authentic Influence and Executive Presence" at Southern Methodist University’s Cox School of Business Executive Leadership Program, participates in the Women's Initiative Fellowship program (empowering female leaders from North Africa and the Middle East) at the Bush Institute, and is a key speaker for the National Hispanic Corporate Council Corporate Executive Development Program. 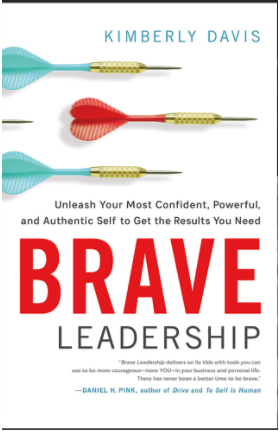 To learn more about "what it means to be brave," I urge you to pick up Kimberly's new book, "Brave Leadership: Unleash Your Most Confident, Authentic, and Powerful Self to Get the Results You Need" (endorsed by Daniel Pink!). Kimberly's book: "Brave Leadership: Unleash Your Most Confident, Authentic, and Powerful Self to Get the Results You Need"